BELL SERIES: All players will be ranked on the PKBGT Performance Index rankings. Results in Bell Series are weighted according to course rating and field strength. BELL SERIES: Champion will receive 8 PBE Performance Stars. Runner-up & 3rd place finisher each will receive 4 PBE Performance Stars. 4th & 5th place finishers will receive 1 PBE Performance Star. This is the last day to submit At-Large applications for the Invitational. For players new to PKBGT, please submit the AT-LARGE INVITATION PLAYER APPLICATION. We will announce the initial selections from the at-large pool at this time. Total number of At-Large exemptions TBD. Additional at-large players may be added at later times based on field availability. Final qualifier for players looking to earn automatic entry. Click here to register for the event. Total number of exemptions available TBA. Last day to register for players who have qualified at the Last Chance Qualifier. The practice round is included in your entry fee. There will be a single tee start on beginning at 11:00 AM; tee times are available every 10 minutes. Players must book their tee times directly with the PKBGT through the link emailed to you starting Wednesday, October 25th at 9:00 AM. DO NOT BOOK practice rounds for Friday through the golf course. Only call the golf course for practice rounds prior to Friday, November 10th. 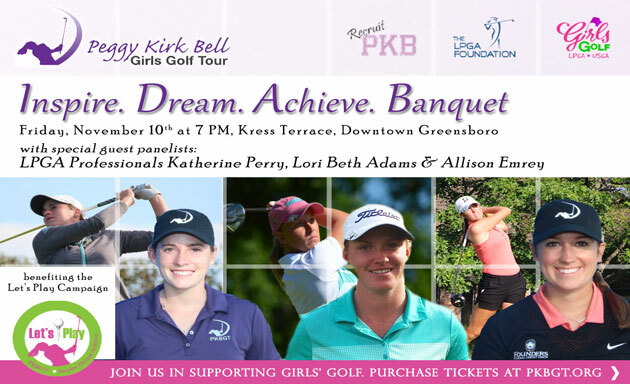 Join us in celebrating the year on the Peggy Kirk Bell Girls' Golf Tour! Round 1 tee times begin off the 1st and 10th tees, weather permitting. Round 2 tee times begin off the 1st and 10th tees, weather permitting. Following round 2, the field size will be reduced to the top-50% and ties (based on # of players starting Round 1). Final Round tee times begin, weather permitting. Awards for the top-six finishers will occur after play concludes.